With well over 1 million subscribers on all platforms and thousands of hours spent on our mods, your donation will help secure a future for our mods, build a community together, and have a home where you can always speak freely if you wish. We have 1,000s of hours ahead of us, and we need your support to deliver epic experiences with some of the highest quality mods in gaming history! Modding is the Team Radious passion. The only thing more rewarding than modding is watching millions of people enjoy our mods. Our mod submissions, mod updates, guides, and resources will always be free to you, and we wouldn't have it any other way. With over 10 years combined modding experience, we want you to know a little bit about Team Radious :). Radious(Jan) is the author of the award-winning mods Radious Total War and Radious Total Units. His mods are some of the most subscribed-to mods on Steam Workshop. Zingertits(Tony) has recently helped Radious update his Total War: Warhammer series and is the author of a ground-breaking set of mods that add building slots in Total War: Warhammer. 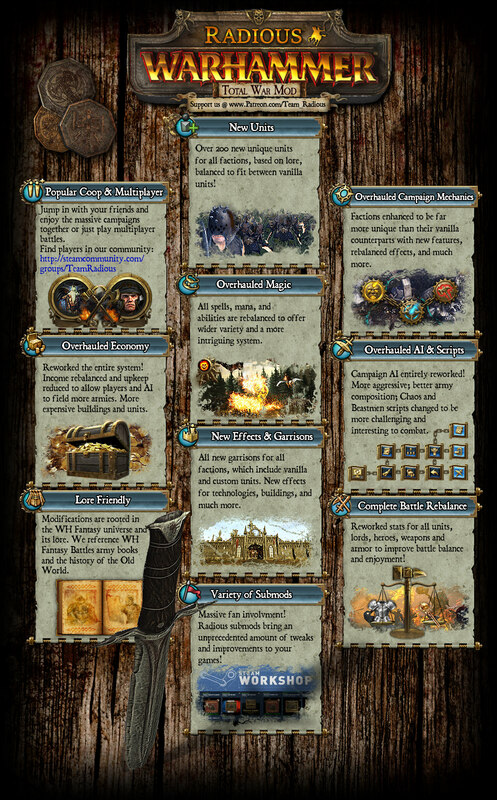 SpartanVI is author of one of the most popular mods on steam workshop for WH1 and WH2 - Building Progression Icons. Synthetic Man – My name is Michael and I just hit 20. I study International Law at Lancaster University, but I’m going to spend my next year on an exchange at Charles University Prague. In my free time, I like to read to broaden my horizons and for my personal enjoyment; mainly philosophy and history for the former and Science-fiction/Fantasy for the latter. I am also a history enthusiast, often trying to understand that which came before us. Furthermore, I enjoy debating these topics and the exchange of ideas accompanying it. I also play a wide variety of games. This includes card and board games, D&D, and of course computer games. Other than that, I like going to the pub or a club with my friends to unwind after a day full of lectures; or to the cinema if we aren’t in the mood for clubbing. Similarly to Radious, I also have a dog, an English Bullterrier cross called Max. I started modding by writing small mods just for myself, and then decided to share them with others so that all could enjoy them. We hope that you take a few minutes to explore our Featured Tags where you will find everything you need to pick up modding, post your thoughts or contribute ideas, discover something that expands your knowledge, or just stay informed. Welcome to the Team Radious Modding Community! Patron-only - You can participate in our Quiz and win DLC or full TW game. Public Thank You - Your name on the Steam Workshop page on all our Attila, WH1, WH2 and ToB mods. Polls - Participate in Team Radious’ mod decision-making by voting in our patron-exclusive polls and receive an additional bonus vote! Discord - Special access to channel for Legendary Lords and Emperors only. Discord - Special access to Patron Beta channel to test upcoming content. Its a great honor for us that you support our work in such a scale. You have our absolute gratitude! Discord - Special access to channel for Legendary Lords, Emperors and Everchosen only.